You cannot go to a technology conference these days without hearing about the Internet of Things (IoT). The consensus is that sensors and information technology will soon be all around us, impacting our daily lives to bring us awareness, efficiency, and safety. We are already experiencing this change via rapidly growing use of smart technology: smart watches, smart refrigerators, and smart buttons on appliances. Where Is the Smart Vehicle? It is difficult to find a phone that is not a smartphone. On the other hand, it is next to impossible to buy an affordable car that is truly a smart vehicle. Innovative manufacturers such as Tesla, Faraday, and Google are the frontrunners when it comes to information technology implementation, while many of the traditional car companies are still in the slow lane. 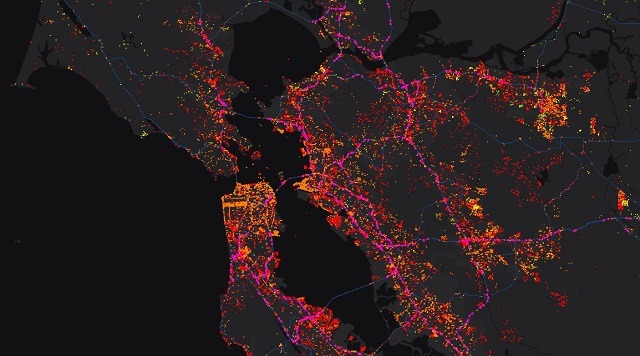 Telematics information from cars traveling in the Bay Area, California. The different colors show different speed, red being the fastest. Bluetooth technology, for example, has been available in smartphones for over 15 years, by contrast, it is barely a vehicle standard in 2015. But don’t worry, the automobile industry is catching up. Volvo has released new technology that allows people to provide one-time access codes to their vehicle’s trunk. Packages can be delivered to your vehicle, making shipments more convenient. And in-vehicle navigation can now access real-time traffic information, greatly improving routing accuracy. But the most exciting advancement, I think, is the work on connected vehicles. Connected vehicles communicate with each other about safety-related issues such as road conditions, changes in other vehicles’ actions, such as sharp braking, or hazards immediately. This new capability relies on telematics, and it is paving the road toward an autonomous, self-driving vehicle. Telematics combines connected vehicle communication with information technology. It is an essential component of smart vehicles, or smart mobility. What makes vehicles smart comes down to three main capabilities: the ability to collect accurate data from a multitude of sources; the computing power to analyze this data or recognize relevant patterns; and the ability to communicate the results effectively to other vehicles, systems, and users. Data sources include speed and temperature sensors in the road, online weather information, and highway management systems. Smart mobility relies on smart location analysis, that is, the awareness of where exactly all these mobile and stationary elements are in relationship to one another. Vehicle sensors can detect information from the immediate surroundings but not about what happened a minute ago at an upcoming stretch of highway or what is predicted to happen. We can help close the gap between telematics and smart mobility with location analysis. Let’s explore an example that describes how location analysis can help smart mobility change how we travel by car. This might sound all too familiar: a family is on the road to pick up Grandma on their way to their favorite winter vacation spot when their vehicle enters an unexpectedly foggy area. The driver immediately slows down, not realizing that the fog has crystalized to ice on the frozen road surface. The car starts spinning out of control and destroys a front tire as it runs over debris on the side of the road. The family pulls out their mobile phone and looks up a nearby tire repair shop. Two hours later, the family is waiting at a local restaurant while their tire is being fixed. As other vehicles pass by the section of road with debris, sensors automatically report this hazard to road crews, which promptly initiate the removal of the obstacle. Road sensors report subfreezing road temperatures to online services, which, in turn, send the vehicle onboard system an alert about hazardous conditions. Real-time weather services report the buildup of fog in the area and send a warning to the highway information system as well as to all vehicles within the area. Highway signs are updated to warn of icy road conditions and fog well ahead of any vehicle entering the unsafe area. Highway authorities dispatch vehicles to spread the right mix and amount of deicing material. The amount of material applied is closely monitored and adjusted based on changing weather and road conditions. Based on historic traffic and road condition information as well as the historic telematics data from thousands of vehicles that have passed through the section under similar conditions, the family’s vehicle calculates a risk factor. The vehicle automatically reduces speed to a safe setting and prompts the driver to choose an alternative: take a 45 minute detour, wait out the immediate danger by stopping at a local restaurant for approximately one hour, or continue on the road as planned. Knowing the alternatives and calculated risk helps the family to quickly make the decision to take a hot chocolate break. Because the vehicle was programmed to update Grandma of any delays, it will send her an automatic text message based on a newly projected, automatically calculated time of arrival. Is This Just a Scenario from the Distant Future? The smart mobility technology is already available. High-end vehicles feature sensors that help with parking or keeping a safe distance from other cars. Cities and other government agencies are working on implementing smart mobility for commuters by providing multimodal information in public transport. They leverage geographic information system technology to provide accurate location analysis. GIS is also a key technology for processing high volumes of location data such as GPS points or vehicle speed. The automobile industry is working on faster, smarter in-vehicle systems that will support a combination of location analysis and smart mobility to the benefit of drivers around the world. IoT is tying hundreds of thousands of sensors together via the Internet. This aggregated information is creating a revolution of possibilities in safety, convenience, and efficiency. It’s also creating a flood of data that will quickly overwhelm existing systems. For example, it is estimated that vehicle sensors in 2020 models will produce up to 350 MB of data per second. This is a few hundred times more data than mobile technology can handle today. The challenge is to analyze this massive flow of “big data” and filter it for data that matters to the user. One of the most critical aspects is location. A new generation of GIS-based real time processing tools for big data is being tested to enable the IoT needs of the future and process hundreds of thousands of datasets per second based on location relevance. For the family in our example, IoT and big data location analysis will mean added safety and convenience. Instead of the kids asking: “Are we there yet?” they will check to see how much more time they have to play their favorite geography-games such as Name the Landmark Ahead, or Who Can Spot the Biggest Park with a Playground within 10 Miles. I, for one, am looking forward to traveling with the IoT. What about you?